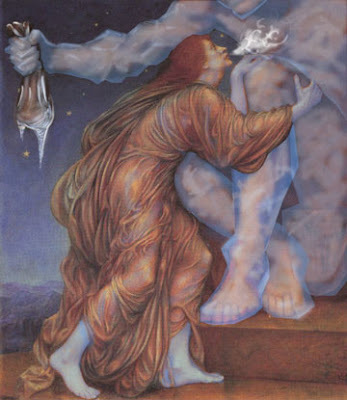 As the credit freeze tightens its icy grip on our shattered economy the worshippers of mammon shiver with disbelief. The mammonists said Hell would never freeze over. But now, in the economic winter, the glittering prizes they craved have slipped through their frozen fingers. 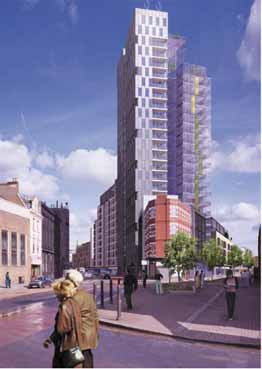 Eighteen months ago, in June 2006, Hammerson unveiled its planned £700m Bishops Place scheme in Shoreditch. Its Chief Executive told analysts and shareholders of Hammerson's "unparalleled record of securing and delivering developments to make big profits for shareholders"
Foster and Partners vision for Hammerson's Bishops Place - a landmark tombstone development of 65,000sq m of private housing, offices, shops and a hotel. Last July Hammerson sought planning permission to demolish The Light and build the 50 storey Bishops Place tower. But by then developers had started to feel the chill of the impending economic winter. 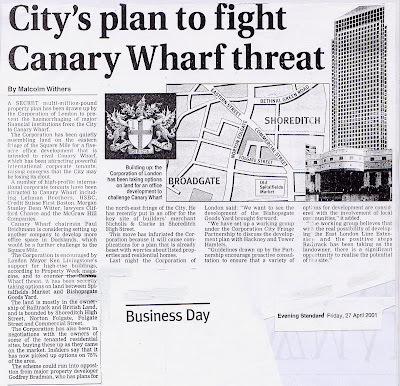 Although the demolition would proceed immediately Hammerson could not confirm when construction would actually start. Facing overwhelming community opposition Hackney Council deferred the application. Hammerson's shareholders looked glum. A second coordinated community campaign forced Hackney Council, on the advice of English Heritage, to finally concede that The Light merits the protection of conservation area status. That decision followed threatening letters to Hackney from City lawyers and was greeted with dismay by Hammerson. Achieving planning permission underpins the value of development sites. 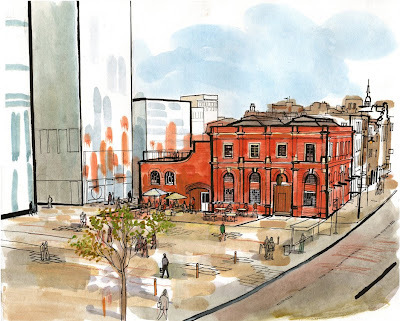 Hammerson may yet renew its planning application to demolish and redevelop The Light as Bishops Place but a refusal now could drive an icicle through Hammerson's heart. Now, in the depths of economic winter, property developers are stricken by the value of their sites being locked into the permafrost of the credit freeze. Hammerson is Britain's fourth biggest property company. Its debt rating has recently been downgraded from stable to negative by credit ratings agency Moodys. It share value has crashed by 60% from a high in April 2007 of £1747p to a fractured 397p today. J P Morgan stated that it was at risk of breaching its bond covenants. Hammerson is reported to have put its flagship Bishops Place (the controversial redevelopment of Spitalfields Market) up for sale - for £60 million less than it was valued in June 2008. Now it also needs to raise £600million by a deeply discounted rights issue to improve its balance sheet. With the carnage in financial services, and tens of thousands more City jobs in peril, the developers' dreams of "regenerating" Shoreditch's Bishopsgate Goodsyard, with a wall of high-rise offices, now looks like a distant mirage. Even if the credit could be raised to build them, or for businesses to rent them, there will be no-one to work there. In fact, a week before the Court hearing, Telford's Chief Executive Andrew Wiseman had already announced that construction of The Block, together with other major schemes, would not be proceeding. "Delivery of these schemes" he said, "...will depend on the availability of finance for Telford and for our customers and our ability to secure future revenues." The schemes are on ice. Since March 2008 Telfords' value has crashed by 90% to its January valuation of £10.8million. Its lender, AIB (Allied Irish Bank), has recently been bailed out at Irish taxpayers expense. What preference AIB might now give Telford over the financial needs of its Irish business customers remains to be seen. The Judge eventually dismissed OPEN's legal challange. 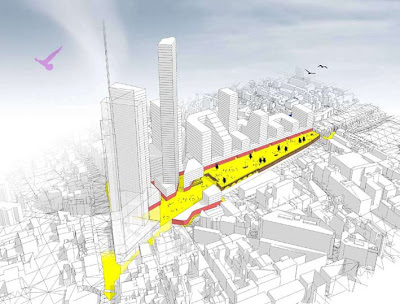 But now it may already be too late for Telford's plans to build The Block in Bethnal Green Road for the forseeable future. Neither have our public authorities escaped the chill of the economic winter. Speculative investments of public money are leading to huge losses. 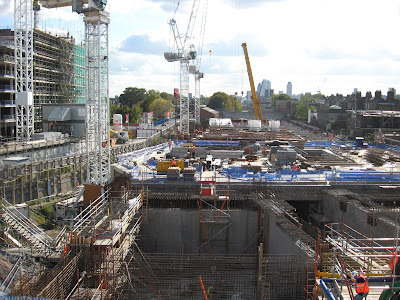 Hackney Council, with the GLA's London Development Agency and Transport for London, have invested over £40 million in The Slab at Dalston Junction - a massive concrete raft spanning the new station cutting intended to provide a turnaround site for 12 buses. Of 550 flats being built to pay for the scheme only 50 are reported to have been sold to date. Public awareness and unease continues to grow that Dalston Square will be left with half-finished concrete stumps. The Slab where Barratt's are to build residential towers of up to 20 storeys. The private/public partnership hoped to sell 500 private flats and attract brand retailers to pay for scheme. With credit and mortgage lending frozen the prospects are now looking increasingly bleak. The scheme was conceived and implemented by a handful of public officials and politicians. OPEN protested at the time that it was an extravagent waste of financial and natural resources and would blight Dalston. We brought three judicial review actions to oppose it and fought to conserve at least something of Dalston's architecural and cultural history. But our pleas fell on deaf ears. The authorities ripped the heart out of Dalston two years ago. If true, as reported, that it is no longer 12 but only 7 bus stands that it now required on The Slab then the scheme's flawed logic, which underpinned the justification for the demolition of historic Dalston and its high-rise redevelopment, has started to fracture. Then, last summer, there was panic. The authorities' chosen developer, Barratt's, share price had crashed 90% and it was having to renegotiate its bank covenants. Barratt had £1.5 billion of debt. If the Bishops Place scheme had gained planning permission last February Hackney hoped to take Hammerson's £14million planning contribution for "off-site affordable housing" in Shoreditch and spend it on The Slab scheme in Dalston - robbing Peter to pay Paul. Now Hackney's Mayor Pipe hopes to persuade the government's Homes and Communities Agency (formerly the Housing Corporation) to buy out some of the 550 private flats. If a "buy to let" scheme funded with yet more public money finds favour we will see, as OPEN predicted, families on housing benefit with children living up to the 20th floor. The slums of the future. But of all the public authorities it would be revelations concerning the City of London's investments which attract the greatest public dismay. Since adopting its Vanity 2000 policy, to contest Canary Wharf's challange to become the nation's home of financial and professional services, the City has invested eyewatering sums of public money assembling sites in Shoreditch for office development. Many of these investments, funded from its secretive "City cash" account, are joint ventures with its private sector partner, Hammerson. In the current economic climate Hammerson must be grateful to have such a well heeled and sympathetic friend in the City to help bear some of its risks. A recent setback for this public/private partnership has been the defeat, by an articulate and well organised community opposition, of its appeal to redevelop Norton Folgate . In the depths of our economic winter the Freemen of the City of London must shiver to hear some financial commentators reporting a 40% drop in Central London commercial property values and that speculative development sites now have a negative value. The £millions of City Cash, invested in property and land deals, are presently locked deep within the permafrosts of Shoreditch. When Spring comes round we may find that much of the City's frozen funds have melted away to slush. Thank you so much for providing much needed insight into the horrific development taking place at Dalston Square. Cheering it may be to see the big developers getting credit crunched, but don't get too gleeful. Handsome buildings that could have been incorporated into a decent plan have already been bulldozed, and half-finished crap plans may well be even worse for the area than fully-completed crap plans. The plans for Dalston were never designed for family housing although, with a possible government bailout, that now looks like what they will become. Is it too late for the railway site plans to be reconsidered and for decent family housing to be built instead? Sadly, from past experience, it's unlikely that the authorities will listen to alternative views let alone admit the plans are dreadful. You're all just a bunch of whining hippies. Who gives a crap about family when we can all worship capitalism?! "We may have to have new partners...."